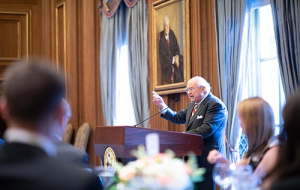 Professor Dan Coquillette was celebrated this summer at a dinner at the US Supreme Court, recognizing his 34 years as Reporter to the Standing Committee on Rules of the Judicial Conference of the United States. On January 1, Coquillette will be appointed Senior Advisor to the committee. Professor Coquillette is not the only Univite in his family. His brother Bill Coquillette (1971, Law) followed him to Univ as a Marshall Scholar and has contributed to a piece about the experience for the upcoming issue of The Martlet. Coquillette also received an award at the dinner from the US Department of Justice for “outstanding service and commitment to the administration of justice”. Supreme Court Justice Neil Gorsuch (1992, DPhil Law) was among those who delivered testimonials at the dinner. Justice Gorsuch worked with Professor Coquillette when he was on the Standing Committee and as Chair of the Appellate Rules Committee.